General Description of IL-4 / Interleukin-4. 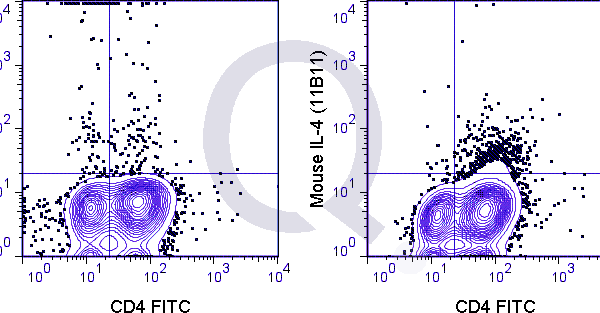 The 11B11 antibody binds to mouse Interleukin-4 (IL-4), a 14 kDa cytokine that is largely secreted by activated T cells of the Th2 subset, and to some degree by NKT and mast cells. This cytokine acts as a stimulatory factor for B cells, inducing their proliferation and differentiation, as well as playing a role in immunoglobulin class-switching. IL-4 may also provide autocrine stimulation for T cells, and affect the function of antigen presenting cells such as macrophages and dendritic cells. IL-4 can bind and signal via three cell surface receptor types: CD124 by itself, CD124 in combination with the common gamma chain (type I complex), or CD124 combined with CD213a1 (type II complex).The 11B11 antibody is widely used for detection of intracellular levels of IL-4 protein by flow cytometry, as well as for analysis of soluble cytokine as measured by ELISA, and in functional assays to neutralization cytokine-receptor interactions. Please choose the appropriate format for each application. 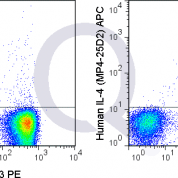 enQuire Bio's Mouse Anti-IL-4 Monoclonal is available for Research Use Only. This antibody is guaranteed to work for a period of two years when properly stored.